There are multiple ways to find data. Browse the indicator tree using one of the five folders: In the News, Key Economic Indicators, Browse by Subject, Browse by Source, and Overlays. Alternatively, use the search box.. When you find an indicator of interest in the indicator tree, click on it. To select multiple indicators, hold down the control (Ctrl) key when clicking on the second (or third) item on the indicator tree. Below, several indicators related to crude oil are selected. Some datasets have multiple dimensions. In the example below from the Occupational Employment Statistics dataset, you can select the statistic of interest by making selections from the criteria panel for geography, industry and occupation. The chart below ranks the top 10 states with respect to annual mean wage for architectural and engineering occupations. For datasets with longer lists of items in the criteria panel, click on the small magnifying glass in the grey bar above the list of items to search through the list. Use the search box to query the repository for topics of interest. In the example below, "manufacturing" is entered into the search box.Notice that as you start typing, precise terms from the dataset and indicator metadata appear in a drop-down box. Any of these can be selected for a precise retrieval. After you run the search, a listing of results view opens. You can scroll the results to select the indicator of interest, which will retrieve the selected data and chart. You can also filter results by subject terms, source, larger database that contains the statistic of interest, and geography. Also note the additional options for search above the search box - more on this below. If you select Advanced Search, you will see options to search by broad category, topic and geography. 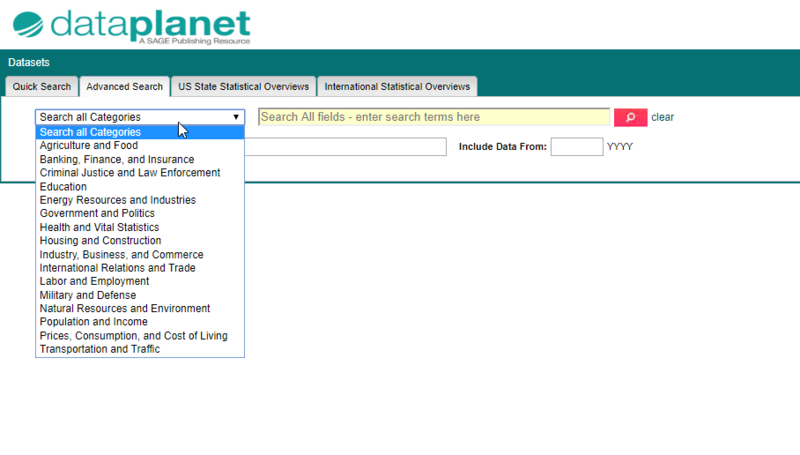 Data Planet assigns datasets to 16 broad categories. You can select one of these from the drop-down list in the category search box to narrow your search. 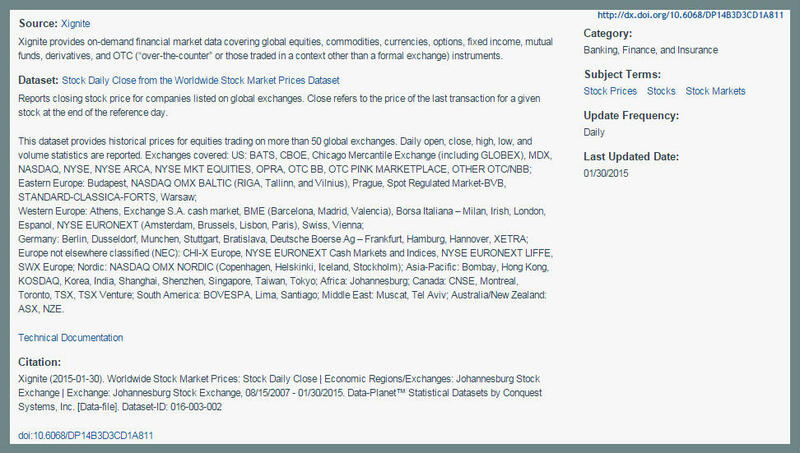 Note the type-ahead feature in the topic and geography boxes, which allows you to conduct very precise searches. Broad Category(ies): Each indicator and dataset are classified in one or two of 16 broad subject areas. Subject Terms: Each indicator is assigned subject terms from the Data Planet controlled vocabulary of indexing terminology. Source: The name of the data provider, with a description of the organization. Dataset: The name of the dataset, followed by an abstract describing the dataset. Technical documentation: A link to technical information on the dataset, as provided by the data source. Citation: Presents the preferred citation format for the data visualization and description. DOI or Option to Create DOI: DOIs, or Digital Object Identifiers, are used to identify content objects in the digital environment. They provide an actionable, interoperable, persistent link of an object, which can be any entity (thing: physical, digital, or abstract). DOIs make it possible to retrieve an exact replica of the statistical abstract, including the data visualization, at the time the DOI was created. This DOI should be included with the Citation. For more on DOIs, click here.